We’ve worked closely with AEG Presents, the live entertainment company, for over 10 years producing content for festivals and entertainment venues across the UK and internationally. In October they asked us to refresh a promo that we created for David Byrne, the former Talking Heads frontman, to promote his latest solo tour. The original promo we created was shown at BST Hyde Park in summer 2018 and focused mainly on stylized illustrations of David and his tour artwork. This time around they wanted something a bit different that incorporated the live element of his show to use on social media. 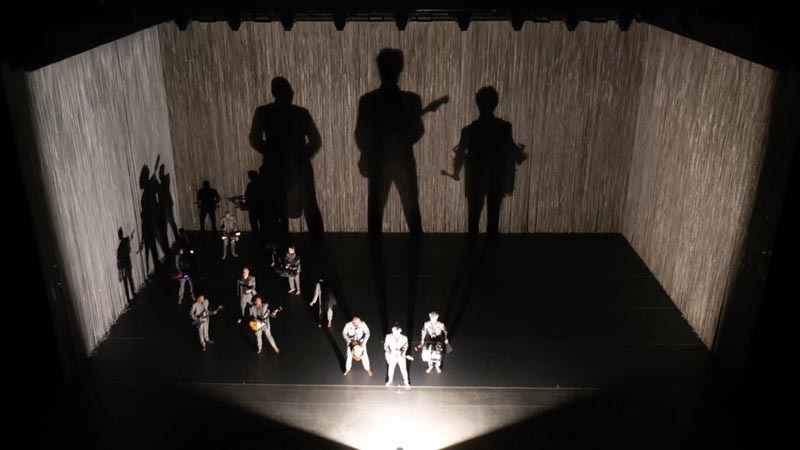 We were provided with access to over 750 tour photos from his recent U.S. tour which we narrowed down to show the best photo sequences that highlighted the energy and performance of the tour and came up with the idea of creating a flipbook animation to bring these to life. Handheld photos of a live performance naturally feature a lot of movement and a varying composition, therefore we had to line up all of the photos in each sequence so that they would appear to flow together seamlessly, creating the illusion of motion. We then experimented with different techniques within After Effects to bring on each new photo in the sequence before slowing the overall frame rate and varying the speed of each photo reveal to mimic the natural variation you would get in a flipbook animation. After the promo was used on social media we were contacted by Todo Mundo, David’s record label, who asked if we could adapt the original video to be used in an upcoming interview with Kirsty Wark on BBC’s Newsnight. We created a pared back version of the promo without any text or logos that could be used in different parts of the interview. The final version was featured on Newsnight, helping to promote the upcoming tour to over 500,000 viewers.